The thermals were rocking at Nanakuli again yesterday, but not everyone was lucky enough to enjoy them. Kuno, one of our Canadian visitors, was hurt while launching. His wing may have snagged during inflation, and he was very briefly airborne before swinging around and impacting the hill to the right of upper launch. Thanks to all the HFD teams for their quick action airlifting him off the hill: Air 1, Rescue 2, and Engine 28. Thanks also to everyone who landed or hiked down to clear the air for the rescue, and to our own Fireman Dave for helping out on the ground. Kuno is having surgery to repair ligaments in his knee today, and will be stuck on the island for a while as he recuperates. Let's all wish him a speedy and full recovery. And let's do what we can to help our visitors stay whole and safe! One final note: please remember that while we appreciate how quickly HFD can respond when we really need them, as they did yesterday, we also need to work harder to minimize false alarms. 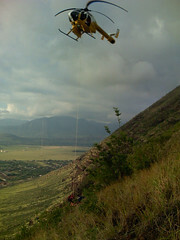 If you are planning to launch a visible spot (like Koko Crater), or if you find your glider temporarily snagged in a tree, or it could otherwise be interpreted as "crashed" by a bystander - please call the alarm bureau at 523-4411 and leave your name and cell number so they can call you if they get any reports. If you have a real report to make, please use 911 for that. Mahalo, HFD! Job well done. I was there, and it was very impressive to watch. I shot a couple videos of the chopper, but nothing outstanding. Thanks for the reminder about calling Fire, Alex. Programming in my phone now.